Offer seasonal discounts each year. Let Premium customers add a discounted coupon to their order. Charge extra for rush hour rentals. Offer $30 off each order over $500. $20 extra charge for all items currently in Baltimore. Coupons can be used to apply standardized discounts or charge customers extra, depending on specific customer, order, or item attributes. 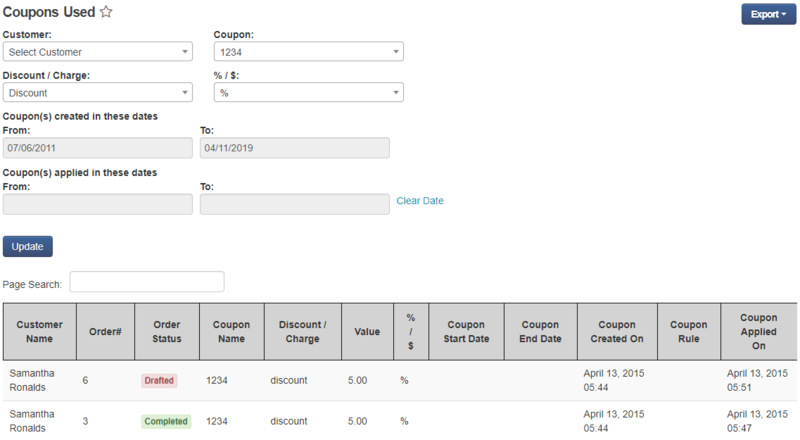 To create a coupon, go to New Coupon under ‘Rules and Coupons’. To use a coupon in a specific order, you can simply click on the Apply Coupon button on the order detail page. Add the name of the coupon in the overlay as shown below, and you’re done. What kinds of coupons can I create? A discount or charge that can either be a flat sum or a percentage value. Unlimited coupon use, or a fixed quantity of available coupons. The ability to set the coupon as single-use per customer. Start and end dates for the coupons, or no expiry date at all. As an example, we’ve drawn up a coupon for a 5% discount below. The system will create 500 of these coupons, with no expiry date set. In addition, each coupon will be single-use per customer. 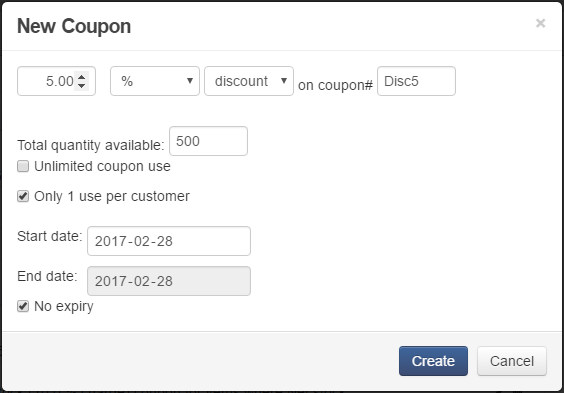 Users can apply the coupon codes when drafting an order, while customers can apply them when placing an order through the webstore. This can be done through online adverts or referrals, and even shared with customers manually. How do I name coupons? A coupon number should only contain numbers, alphabets and/or a dash symbol (-). Coupons need to be uniquely named, and must not exceed 30 characters. Rules can automatically apply coupons to an order when the right conditions are met. These conditions can be on duration, customer types, item properties, and more. You can also set up rules but have them disabled when you don’t need them. Only enabled rules are applied on orders. What kinds of rental rules can I create? Customer categories can be set up in EZRentOut. This is a great way of keeping track of different groups of customers and catering to their specific needs efficiently. You can also create rental rules based on these categories. 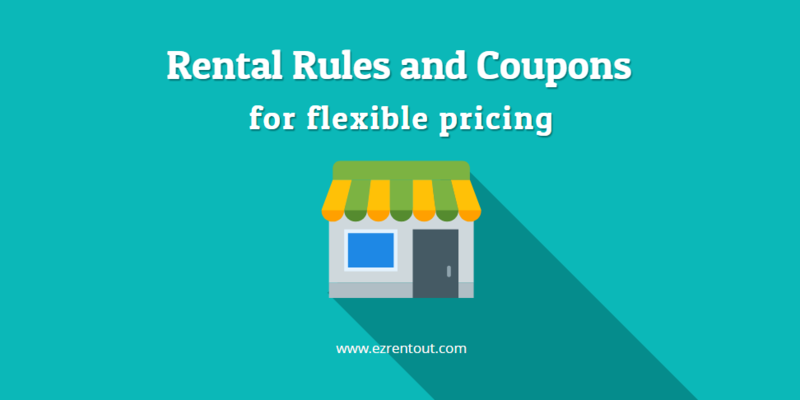 The Customer Category rental rule enables you to let customers use a specific coupon themselves, or to apply it by default if they belong to a specific category. You can also let customers use coupons or apply those coupons directly to an order if it contains an item having specific properties. This could include the group the item belongs to, the hourly rate of the item, the location it is present in, etc. 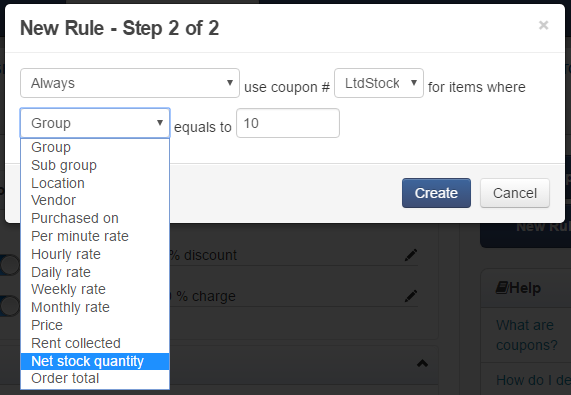 In the example below, we’re applying a ‘Limited Stock’ coupon when an item’s net stock quantity reaches 10. This way, customers will be charged extra if the item they have requested is short in supply. Responding to seasonality is extremely crucial for rental businesses. Our equipment rental software enables you to adjust pricing during set periods by creating seasonal rental rules. In the example below, we’re repeating a 5% summer discount every year, between the months of April and July. 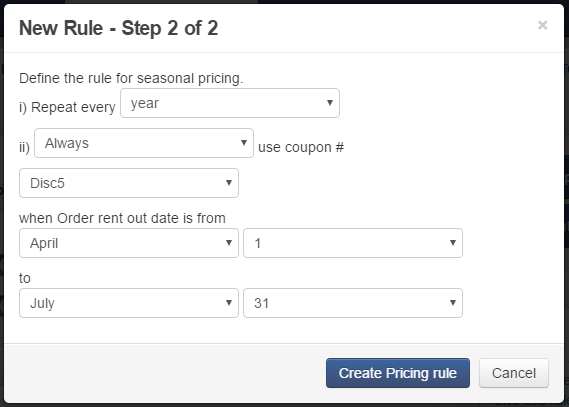 This rule is particularly flexible, and can be used to cater to any number of season-specific rental rates. This is one of our most popular rental rules. You can apply charge-based or discount coupons to encourage customers to rent items for a specific period of time. You might want to give a discount for longer rental durations, for example, or discourage customers from renting items out for long periods during the rush hour. In the example below, we’ve applied a flat fee of $20 for any customer whose order duration is less than 24 hours. You can also add coupons based on an order total. Apply discounts to encourage customers to spend more, or add a small charge for processing smaller orders. In the example below, we’re allowing customers to apply a 5% discount to any order that exceeds $500. Please note: In order to enable customer to use coupons on the Webstore, it is necessary to create a rental rule allowing for it as shown above. You can also allow the coupon chosen to be applied to all orders. To do this, simply define the gross amount above to be greater than 0. Users can also see the usage of their coupons and highlight the most popular ones. To access this information, go to Reports → Orders Reports → Coupons Used. Here, you can choose columns to show and apply filters to your report. For instance which customer used Coupon ‘XYZ’ the most! For more assistance, drop us an email at support@ezrentout.com. You can also share your ideas on our Community Forum regarding our rental software. This entry was posted in [Support], Rules and Coupons and tagged rental rules and coupons by admin. Bookmark the permalink.